- Reduce patient´s stress level. - Slows the pulse rate and stabilizes breathing. - Improves communication between staff and patient. Patients who enter a clinic, a medical or dental practice may be anxious about the outcome and the procedure itself. atmosphere healthcare is a calming and stress-relieving visual platform for clinics, waiting rooms, medical and dental practices. 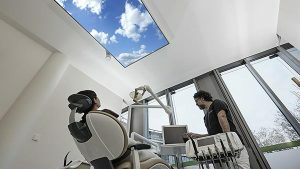 atmosphere is showing the most realistic impressions of nature in a relaxing and immersive way, specifically produced to help patients to calm down. atmosphere healthcare takes patients on a journey through beautiful and dreamy landscapes; waterfalls, ocean waves or deserts creating a unique and calming experience. Health professionals realize that reducing stress by providing comforting and relaxing entertainment is integral to successful healthcare delivery. Industry estimates show that between 30 and 40 million people avoid going to the dentist because of Dental Anxiety, or fear related to seeking or receiving dental care. This anxiety heightens in the waiting room. The perfect solution for any location and size. 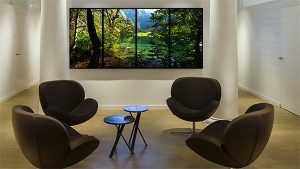 The atmosphere healthcare films are created to stimulate the cognitive perception of the viewer and to trigger the same psycho-physiological relaxation response as an experience of real nature. These immersive films can achieve these beneficial results by showing a reproduction of nature so realistic that patients can experience and automatically respond as if they were being exposed to the actual scene they are watching and hearing. The atmosphere healthcare films are produced in the atmosphere healthcare “Slow Movement” technique with state of the art resolution quality in 6K and with a very high frame rate, 96 fps. This deceleration of life technique minimizes the unnatural frame effect on the eyes and has a therapeutic effect by leading the patient into a tranquil and well-being mood. The calming and soothing results created by an atmosphere installation is ideal for use in different areas of the healthcare sector and can be adapted to different patient groups. Waiting Rooms: Creating an optimal calming and stress-relieving atmosphere to improve communication effectiveness between medical staff and patient. Dental Treatment Rooms: Dental anxiety is a common phenomenon. The atmosphere slow movement content is produced to help patients to calm down. Delivery rooms: Creating a birth friendly environment, a calming and stimulating ambience for the benefit of women in labour, their families and the medical staff. 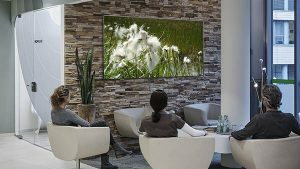 Relaxing rooms: for hospitals and psychiatric wards, creating a comforting room where patients can relax from negative external stressors watching immersive slow movement films of nature.